North American Soccer League teams are partnering with the American Cancer Society this September to bring awareness and research funding to pediatric cancer. The North American Soccer League proudly supports the efforts of the American Cancer Society to help save lives from childhood cancer – and all cancers. All donations will be dedicated to pediatric cancer research and awareness through American Cancer Society. Together, we fight the #1 disease killer of children in the United States by GOING GOLD! 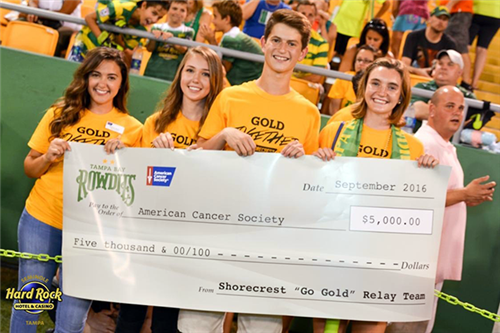 Last Saturday at the Tampa Bay Rowdies game, $20,000 was raised for a pediatric cancer research grant with American Cancer Society AND $16,000 from the Rowdies for Johns Hopkins All Children’s Hospital for oncology research as well. Of that, $5000 was pledged by Relay For Life of Shorecrest. There is still a $15,000+ potential for the last 4 Rowdies games in October by going #GoldTogether. One of those games is Shorecrest Night with the Rowdies. We'll have a tailgate starting at 5:30 before the game, where we'll be selling our Go Gold T-shirts to wear for the game. There are special ticket prices and on-field opportunities for Lower School students. Learn more here.